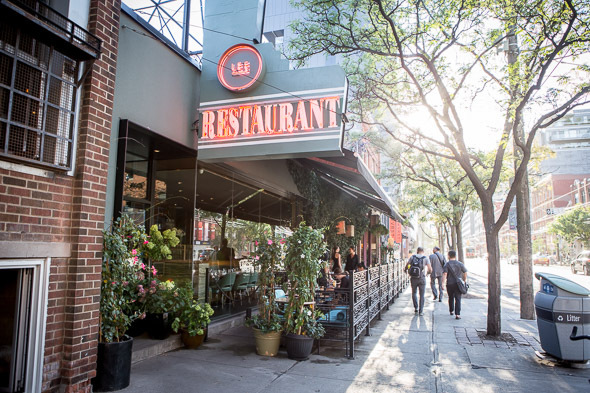 Lee Restaurant is one of Toronto's most venerable dining institutions, headed by star chef Susur Lee . The food here is meant for sharing so prepare to order a lot and try a range of items from the menu. 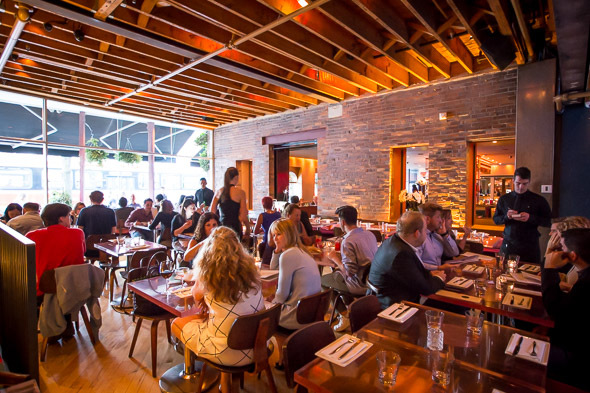 The restaurant is stunning in design, with a neon sign outside, good flow between front room, dining room and patio. Seating is defined by soft cushions and wooden benches, and the glowing bar at the centre of the front room creates visual interest and is surrounded by plush stools. The signature drink here is the Mandarin Monkey ($18), a vodka-based cocktail made with mandarins strained with their rinds as well as fresh-squeezed orange juice. 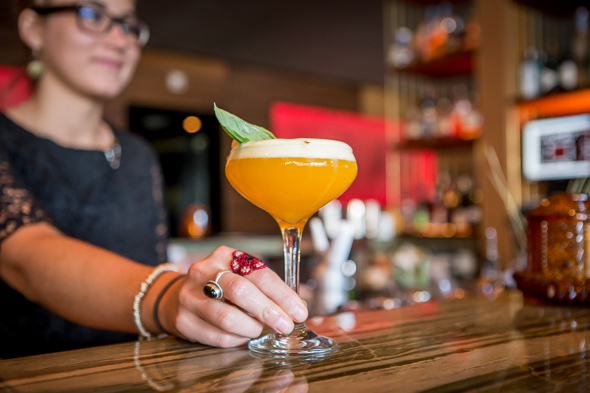 They also add Soho lychee liqueur and Golden Pear pear liqueur, shake it and strain everything into a martini glass, topping it with a mandarin foam and a lychee, goji berry and basil leaf garnish. 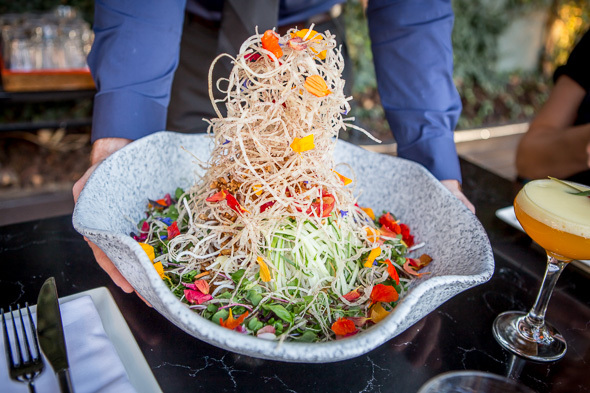 As for Lee's signature dish, the Singaporean-style slaw ($25) is composed of nineteen ingredients: julienned carrot, cucumber, jicama, daikon, and tomato; pickled ginger and onion, and green onion; basil, coriander, daikon and celery sprouts; crushed roasted peanuts, toasted sesame seeds and ume (plum) dressing, all topped with crispy shallots, vermicelli, taro root and edible flowers. 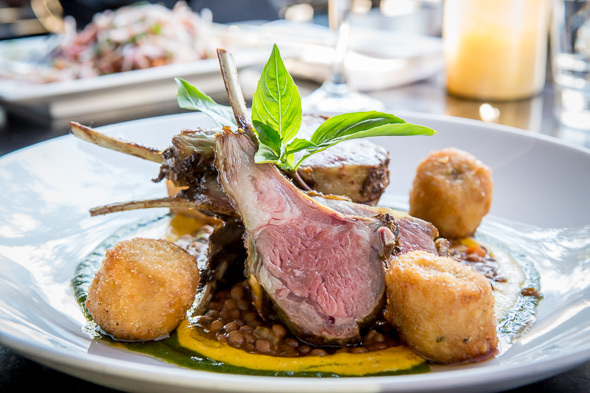 Our stunning main course is the rack of lamb "Thailandaise" ($38). The lamb is marinated in a dry green curry rub before getting a quick sear and then going into the oven. It's then plated on concentric pools of stewed tomato cumin lentils, chili mint chutney, and carrot cardamom coconut chutney, surrounded by banana fritters. Make sure to get all these elements in one bite. Dessert ($18) is similarly spellbinding. Chinese rice dumplings are filled with dark chocolate ganache, crumbled peanut and hazelnut, shredded coconut and black sesame, topped with a chocolate crumble, creme anglaise and raspberry puree and passion fruit sauce. Pop a dumpling in your mouth all in one go using the spoon it's served in. 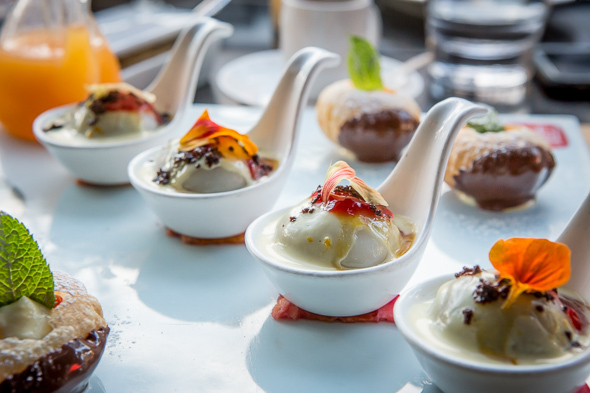 On the side are little shells made of pani puri pastry dipped in chocolate and filled with creme brulee, topped with diced strawberries and garnished with a mint leaf. On the side is some rose peach water which you dribble into the pastry cup yourself. Eat these all in one bite, too.